Wellsville is seeking its third B2 title in the last five years, having won the championship in 2015 and 2016. As the Wellsville Lions attempt to regain control of Class B2, the year of returns continues in Class B with the Wayland-Cohocton Eagles pushing their way back into the spotlight. Wayland-Cohocton looks to recapture its 2012 magic, something of which Wellsville has familiarity. 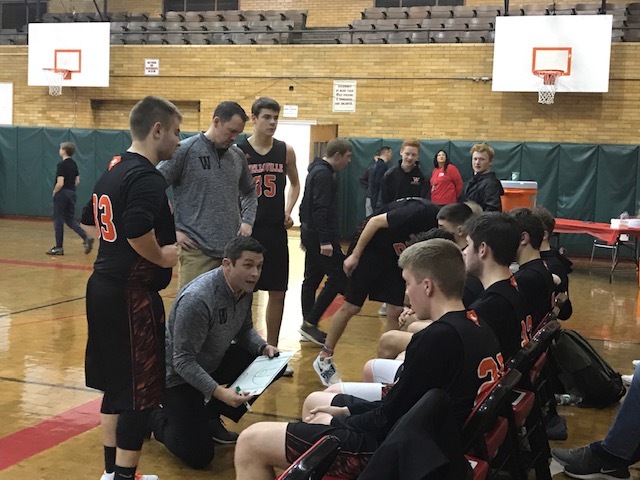 When: Saturday March 2nd, 11 a.m.
How they got here: Wellsville beat World of Inquiry 70-62 in the quarterfinals and Attica 58-40 in the semifinals. 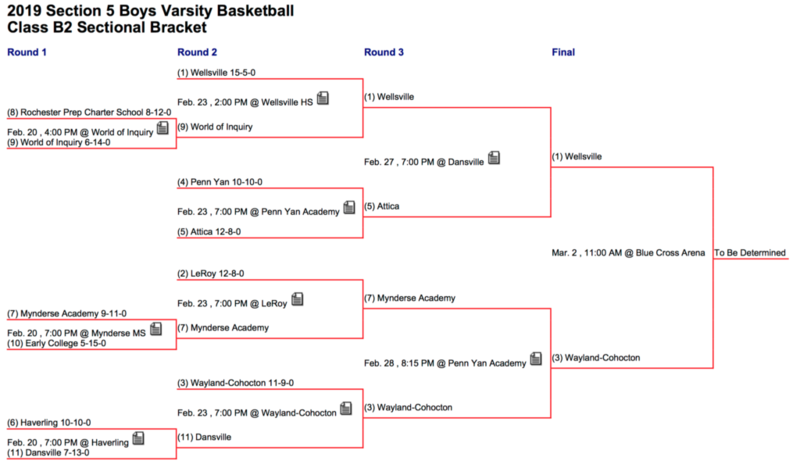 Way-Co defeated Dansville 74-43 in the quarterfinals and then Mynderse 63-54 in the semifinals. Last time they met: The two teams have faced each other twice already this season, both Wellsville wins. The first game came on December 14, in which Joe Tronetti drained a game-winning three with 4.7 seconds on the clock, giving Wellsville the 66-63 win. 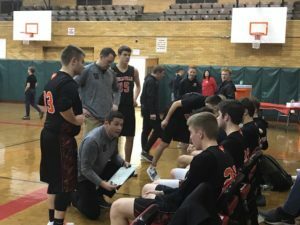 The second game, rounding out the regular season on February 11, saw Wellsville take a definitive 73-57 win. History 101: Wellsville is seeking its third B2 title in the last five years, having won the championship in 2015 and 2016. Last year, Wellsville fell to Mynderse in the quarterfinals, and in 2017 they lost to Greece Odyssey in the first round. Way-Co last won the B2 championship in 2012, beating Wellsville 55-48, though Wellsville paid Way-Co back with a quarterfinal exit the following year. Way-Co had not reached the finals, or semifinals, since its 2012 title win. How they match up: Wellsville has won 10 of its last 11 games, while Way-Co has won seven of its last eight games. Wellsville averaged 57.95 points scored per game during the regular season, dropping below 50 points just three times (all consecutively). Wellsville also allowed 51.20 points per game, keeping opponents below 60 points in all but six contests. Way-Co scored 64.67 points per game this season, topping 70 points seven times and winning every game in which they had over 60 points. Way-Co gave up 57.72 points per game during the season, allowing 70-or-more points once: a 83-66 loss to Caledonia-Mumford. 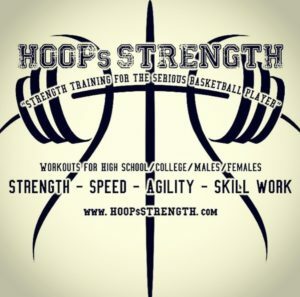 Players to Watch for Wellsville: Alec Acampora Sr. G 12.0 PPG, 5.3 APG; Max Jusianiec Jr. G 18.5 PPG, 9.2 RPG, 6.4 APG; Joe Tronetti Sr. G 18.3 PPG, 6.0 RPG, 4.2 APG. For Wayland-Cohocton: DeAndre Green Jr. F, Cameron Huber Jr. F, Jamie Carman Jr. F, Connor Englert Sr. G.
What’s at Stake: The winner will face the Greece Odyssey vs. Newark winner in the Class B NYS Far West Regional Qualifier. Screen grab courtesy of Section V Athletics.